Plenty Of Fish / POF - Reviews, Cost, all the informations! See 2 opinions about Plenty of Fish (POF). 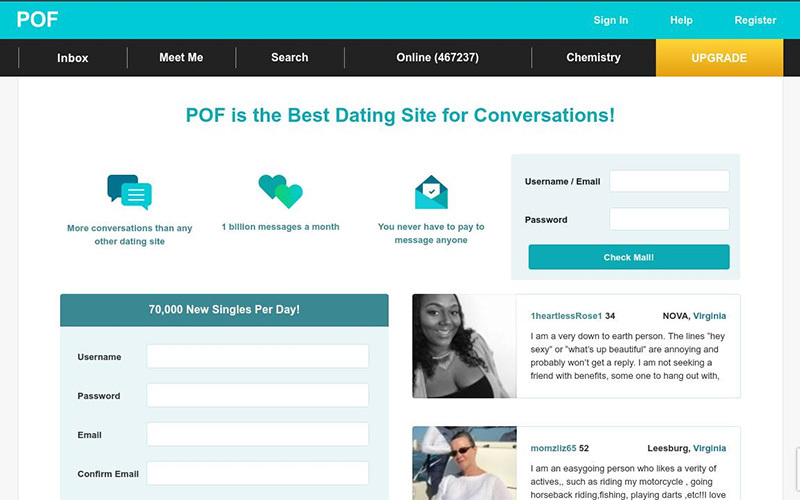 Plenty of Fish, aias POF, is a dating site founded in 2003. He claim 500 000 members in USA. Plenty of Fish is one of the most popular dating websites. To create an account on Plenty of Fish you have to take the Chemistry Test and Relationship Needs Assessment. Registration and all forms of matching are free. You can see who’s viewed your profile as well as send and receive messages. POF say that 80% of their usage is via a mobile phone. The Plenty of Fish subscription is below average dating sites. Is POF a good dating site? Because Plenty of Fish is basically 100% free anyone and everyone can join, which makes it hard to sort through people who are serious about finding a date or partner and those who aren’t or who are fake. Plenty of Fish is more like badoo or okcupid. If you want quick and fun relationship, POF is maybe for you. If you seeking a serious relationgship, POF is maybe not for you. In addition to leaving a comment below, you can give a rating to Plenty of Fish (POF) by giving it stars. You will help other users. select “Edit Profile”, click the links “to hide your profile from others, click here.”. You want to unhide? Easy : in your profil, click on the link “to unhide your profile from others, click here”. Bye!